One of the most ingenious and suspenseful adventure films of all time, thrillingly celebrates the heroism of men who never gave up the fight. What makes The Great Escape an essential WWII movie? Although a fair amount of Hollywod-ization went into this film, it masterfully manages to convey the look, feel and spirit of the largest breakout from a German POW camp of the war. To feel the plight of Allied prisoners of war, this is it. In 1943, the Germans opened Stalag Luft North, a maximum-security prisoner-of-war camp, designed to hold even the craftiest escape artists. In doing so, however, the Nazis unwittingly assembled the finest escape team in military history brilliantly portrayed here by Steve McQueen, James Garner, Charles Bronson and James Coburn who worked on what became the largest prison breakout ever attempted. One of the most ingenious and suspenseful adventure films of all time, The Great Escape is a masterful collaboration between director John Sturges (The Magnificent Seven), screenwriters James Clavell (Shogun) and W.R. Burnett (Little Caesar), and composer Elmer Bernstein. Based on a true story, The Great Escape is epic entertainment that "entertains,captivates, thrills and stirs" (Variety). 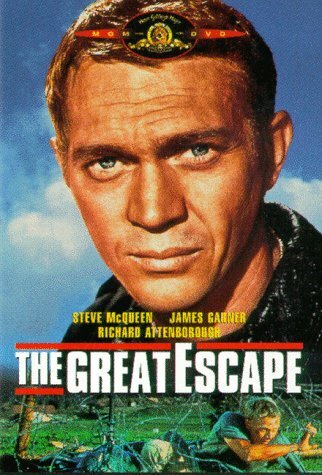 A stirring example of courage and the indomitable human spirit, for many John Sturges's The Great Escape is both the definitive World War II drama and the nonpareil prison escape movie. Featuring an unequalled ensemble cast in a rivetingly authentic true-life scenario set to Elmer Bernstein's admirable music, this picture is both a template for subsequent action-adventure movies and one of the last glories of Golden Age Hollywood. Reunited with the director who made him a star in The Magnificent Seven, Steve McQueen gives a career-defining performance as the laconic Hilts, the baseball-loving, motorbike-riding "Cooler King."